Benefits: Provides a good source of resistant starch to feed beneficial gut microbes. Also a good source of phytonutrients and dietary fiber, vitamin C, vitamin E, folate, vitamin B6, pantothenic acid, and potassium. Cilantro is a super food capable of supporting liver detoxification. The goal of eating a rainbow of color is accomplished with this recipe. Caution for those eating a low carb diet as jicama is a high starch food and pineapple is high in natural fruit sugar. Combine the above prepared fresh fruit and vegetables in a large bowl. Squeeze lime juice over mixture and lightly season with salt. Chill to meld flavors for at least 3 hours before serving with corn chips or over a salad with shredded barbacoa beef. NOTE: I recommend Siete grain free chips cooked in avocado oil or organic Late July or Trader Joe’s Organic corn chips. 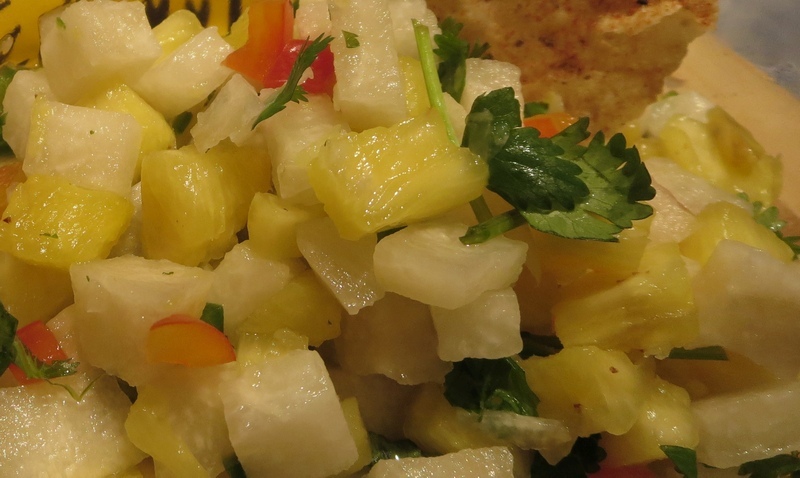 This recipe is also great eaten as a side salad or dessert if you omit the jalapeno.